All 20 players leave and join Cumbernauld Colts, leaving Airdrie without a team for new season. An entire football team has quit and defected to a rival club - claiming they didn't get the financial backing they needed to stay. All 20 members of Airdrie FC Ladies have now packed up their kit bags and joined the ranks of nearby Cumbernauld Colts just a few miles down the road. It leaves the Diamonds without a woman's team for the first time in over a decade - just three months before the start of the new season. Player manager Julie McSherry revealed they made the move reluctantly, but said the costs of staying just didn't add up. McSherry, who has led the team for 15 years, said: "The club was fantastic, and managing director Ann Marie Ballantyne was great. "But we couldn’t afford the facilities for games and training. “There’s no youth set-up for a ladies team at Airdrie and it doesn’t look like there’ll be one soon either, so we felt it was the right move." “Stephen Bole [Airdrie ladies’ club secretary] thought we were doing the wrong thing, but we’re still in negotiations with him." While the incomes for men's football continue to grow at astronomical rates, the ladies' game doesn't receive the same kind of funding and sponsorship. Barely any females in Scotland are professional footballers full-time, even at the highly rated Glasgow City FC. While some women's teams can pay their players, the majority of teams' funds are spent on hiring venues and supporting the cost of facilities and matches. This is a position that Airdrie said it is in. Despite the abruptness and the severity of the move, the game's professional body, Scottish Women’s Football (SWF), said it is supportive of the players' decision to quit. Maureen McGonigle, executive administrator at the SWF, said: “We weren’t closely involved but we support all clubs who want to make the move into the game. 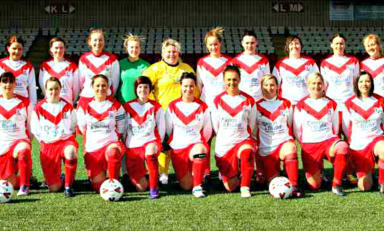 “Cumbernauld is a strong area for women’s football. It’s a positive move. Cumbernauld Colts have 16 boys teams and two amateur men's teams, with nine of them competing in a number of associations across the region including in the Lanarkshire YFA and the Cumbernauld and Kilsyth District Youth League. There are also three girls teams adding to the new ladies team; the girls U13′s play seven-a-sides within the SWF Central/West Divison. The ladies game is similar to the men's, with a Premier League, followed by Football League First and Second Division. The defection of the Airdrie players and the decision by Airdrie to wind up their squad could now allow the Colts to take their place in the women's football league First Division, just below the Premier League. Stewart MacKenzie, Cumbernauld Colts chairman, said: “One of our coaches used to play with Airdrie and we were looking to enhance our team and they were interested. “We are the only providers of a girls 16s football team in Cumbernauld. Our next plan is to go into schools and see if girls are playing for teams. "If they aren't then we need to find out why. “The Airdrie ladies decision was based around the infrastructure that we’re providing and Airdrie aren’t. They were left in isolation there. Despite seeing their squad quit, Airdrie said they are relatively calm about the players' decision and admit that there are no fresh plans to replace the lost players and will instead close their ladies' team. Ann Marie Ballantyne, managing director at the club, said: “I don’t think there’s a market for it at the moment. "One of the problems is players have a wide age range so we wouldn’t have enough players to fill each team. “To be fair I knew how difficult they were finding the stadium financially. "The problem is to have a facility like this is very, very expensive.